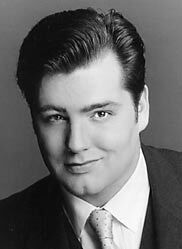 Even in the crowded field of excellent young baritones, James Westman stands out as someone special. First of all, his voice has the makings of that rarest of rare breeds  a Verdi baritone. The sound is rich and smooth, the timbre warm and ingratiating. Tall and imposing, he moves well on stage and has all the right dramatic instincts. And to top it off, the voice is sufficiently large to be heard in the oversized opera houses of today. At thirty  a relatively young age for a baritone, the voice is sure to mature further and gain even more volume, bite and power. So it comes as no surprise that he is the recipient of many awards and is represented by none other than the high-powered Columbia Artists Management in New York. Despite his international fame, Westman continues to appear in Canada, and in fact has recently made his permanent home in Stratford, Ontario, a stone's throw from his birthplace of St. Marys. The Glenn Gould recital represented his return to Toronto after a highly successful joint concert with soprano Isabel Bayrakdarian and the COC Orchestra last April. The program was a well balanced one, with his beloved Finzi and Butterworth to be sure, but also a dollop of Debussy and Hugo Wolf, plus three Zarzuelas that closed the formal offering, a relatively new addition to his repertoire. He started with the Finzi group, Let us garlands bring. The voice was not sufficiently warmed up at this point and his expressions were rather muted, with selections often sung with his hands clasped behind his back. By the fourth song, O mistress mine, he came alive and sang with his customary generous tone and warm stage presence. To these ears, the highlight of the first half was the Wolf songs. Now in full flight, Fusreise was imbued with a delightful sense of mischief, and Auf ein altes Bild showed off his lovely, focused tone. Both Verborgenheit and Er ist's benefited from Westman's heartfelt sincerity and vivid communicativeness. On a previous Glenn Gould recital, Westman offered the more familiar Butterworth cycle, A Shropshire Lad, to great acclaim. This time around, Westman showed that the Bredon Hill set is every bit as touching in the right hands. As a song, Bredon Hill is quite a tour de force, and Westman's voice rang out thrillingly, capped with a strong, brilliant high note at the phrase, "I hear you" at the end. Also memorable was the quieter moments in Oh fair enough are sky and plain, with the opening lines sung in an exquisite half voice. But the genuine surprise of the evening was the Three Zarzuelas. These are really not songs but operatic arias, requiring robust tone and a full spectrum of emotion and drama, which Westman served up generously. He relied on the text for these, explaining to the audience: "I dedicated these songs to friends in San Francisco who introduced me to them. But they didn't tell me how hard the language is!" Well, a Venezuelan friend who was in the audience told me afterwards that Westman's Spanish was well nigh perfect! The audience responded to the end of the formal program with sustained and vociferous applause. Westman dedicated the first encore, Strauss' Zueignung, to the Aldeburgh Connection and to the CBC  "it is at these times that it is very important to listen to wonderful music." His 'signature piece', Di Provenza il mar from Verdi's La Traviata came next, with Westman pulling out all the stops, offering plenty of drama and resplendent high notes. His diminuendo and crescendo that ended the aria was amazing. And coming full circle, Westman gave as his third encore a song he also sang in his last Glenn Gould recital four years ago  John Beckwith's rollicking St. John's Girl, and the audience went home happy. For those of you who missed all the fun, the concert was taped for future broadcast on In Performance on CBC Radio Two.